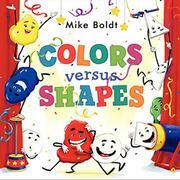 Boldt (123 versus ABC, 2013) continues to mix things up; this time, colors and shapes audition to be the stars of a book. Team 1 consists of colors—blobs with arms, legs and faces. They are invited to take the stage first, but they’re interrupted by Team 2—white anthropomorphized shapes with big attitudes: “Clearly we’re going to win this contest….So you may as well just skip those fellas.” Well, them’s fightin’ words. The colors begin to show off, mixing primaries to make secondaries (blue and yellow combine, and green is the result—but all three still exist separately, which may puzzle readers). Meanwhile, two triangles make a square, the only combination; from there, they simply add angles and sides. The yelling escalates until red and octagon accidently collide. Cooperation leads to a colorful, wordless spread that showcases colorful objects built from basic shapes, though not all of them are easily individuated (the three sections of an apple-tree trunk, for instance); Stella Blackstone’s Ship Shapes (2006) did a much better job with regard to combining shapes into scenes. In the end, the judges (the stars of 123 versus ABC) give colors a 10 and shapes an A+, and obviously, they are both the stars of this book. Boldt’s digital illustrations are just as colorful and zany as those in his previous book, but readers may have some trouble following the numerous, crowded speech bubbles.